The Kansas City Chiefs took the next step in 2018, winning their third consecutive AFC West title and their first home playoff game since January of 1994. Their Super Bowl aspirations came one game short, as NFL MVP Patrick Mahomes was unable to overcome the shortcomings of one of the league’s worst defenses and defeat the Patriots at home in the AFC Championship Game. Patrick Mahomes was the most valuable player in the NFL by our Wins Above Replacement metric, and he was not only prolific in making big plays in his first year as a starter, but he was also excellent at limiting bad plays. Tyreek Hill broke the PFF record for most deep receiving yards, and he is quickly becoming one of the biggest matchup problems in the entire league. 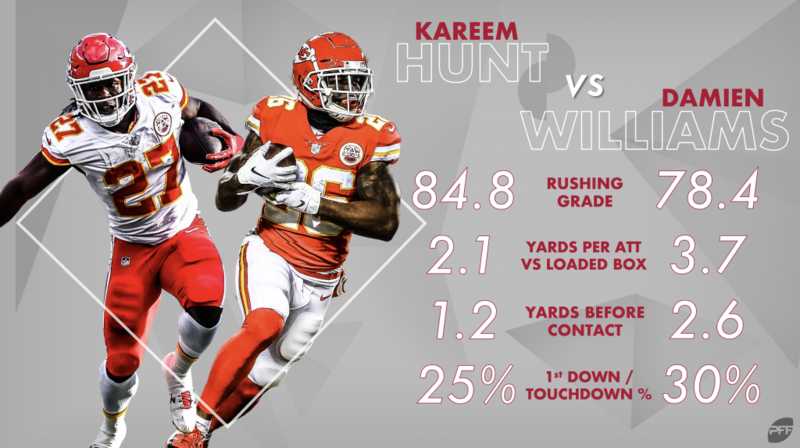 The loss of Kareem Hunt gave life to Damien Williams, who stepped right in as another anecdote that running backs are largely replaceable in the NFL. 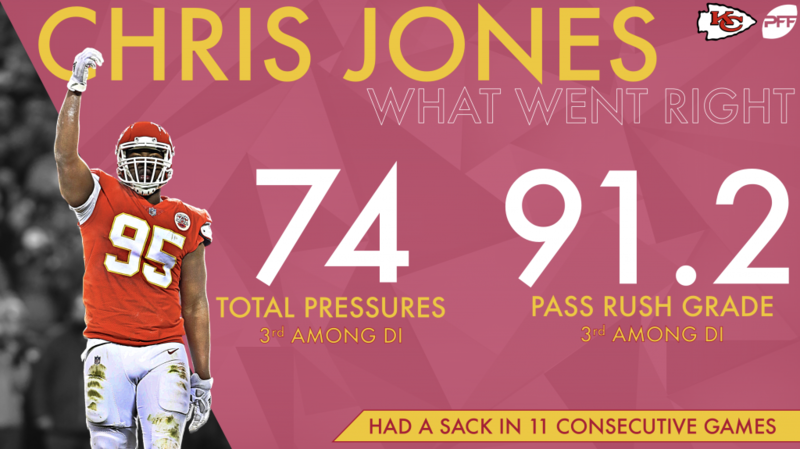 Chris Jones proved to be one of the NFL’s top pass-rushing interior defenders, generating 74 pressures in the regular season and earning a sack in 11 consecutive games. After an inconsistent first four years for Dee Ford, the former first-round pick from Auburn put forth a career-best grade (88.6). 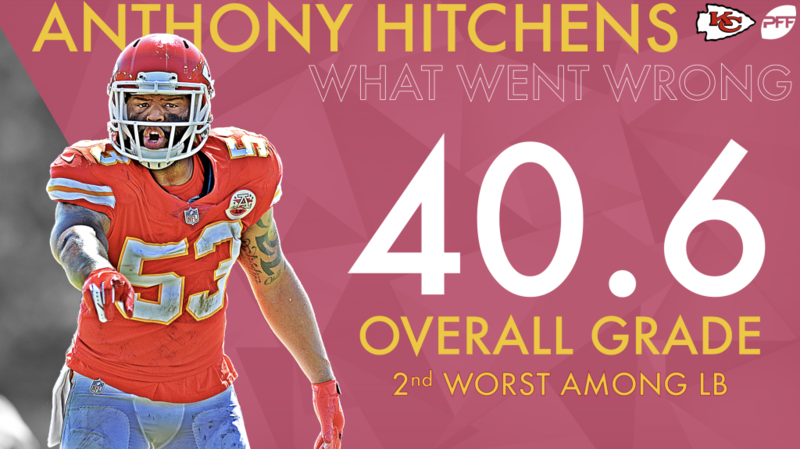 Signed to replace long-time stalwart Derrick Johnson, Anthony Hitchens failed to reward the Chiefs for their investment in him. He finished with a 40.6 overall grade that was emblematic of their entire linebacking corps. 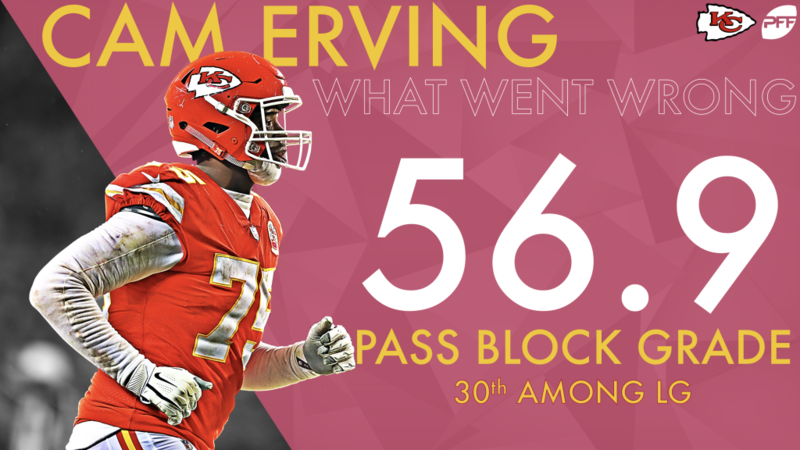 While the Chiefs were solid at the tackle positions, the interior of their offensive line struggled in pass protection, especially late in the season, when Cam Erving was a liability on every snap. The second-year player from Texas Tech was good at everything in his first season as a starter. He led all quarterbacks in the NFL in passer rating from a clean pocket, while he also fielded an outrageous 41/4 touchdown-to-interception ratio when he was kept clean from pressure. The Chiefs struggled defensively in 2018, but the interior of their defensive line was not the reason. Jones has continued to improve each year after being a second-round pick in 2016, finishing third among interior defenders with a 91.2 pass-rushing grade in 2018. Special teams coach Dave Toub has always been able to get the most out of young players on special teams, and Smith is just the latest. 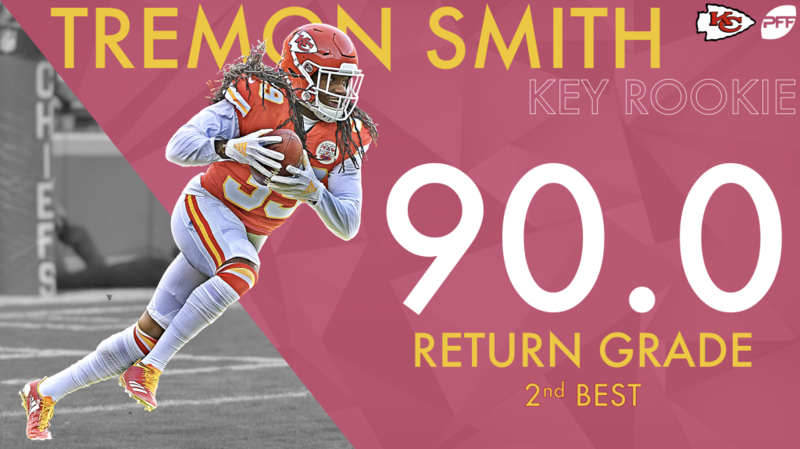 His 90.0 kick returning grade was the second-best in the league, as he turned 33 kickoff returns into almost 900 yards in 2018. After years of winning but being an arm’s length away from Super Bowl contention with Alex Smith, the Chiefs are primed to make a run a championship in 2019 with Patrick Mahomes and Andy Reid, one of our highest-rated coaches over the last half a decade. If Steve Spagnuolo can help get their defense closer to average, watch out for Kansas City in 2019.